DIY Leather: Make Your Own DIY Leather Bracelet - A Perfect Gift! I love the look of leather! Not only are leather accessories trendy right now, but they can also be very expensive. You can create your own DIY Leather Bracelet with minimal sewing, a little cutting, and some imagination. 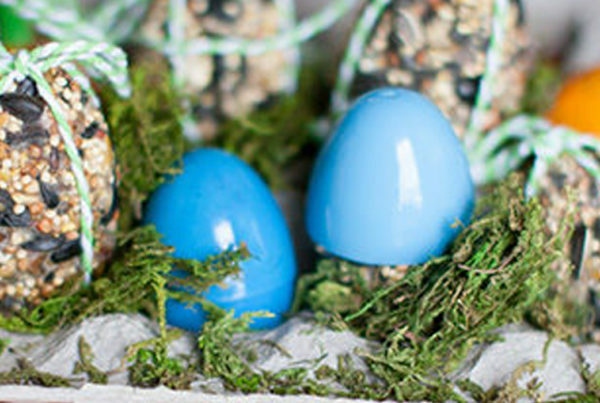 The best part, you can do it for a lot cheaper than what you could find in a store or boutique! But before we dive in, don’t forget to link up your craft or recipe post at the bottom of this post. 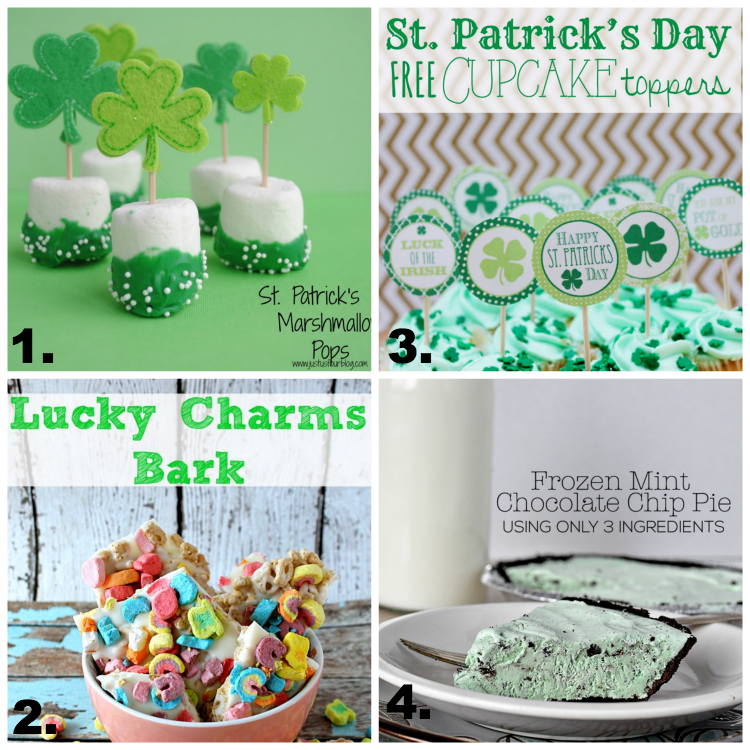 Last week we had 447 people link up their posts! 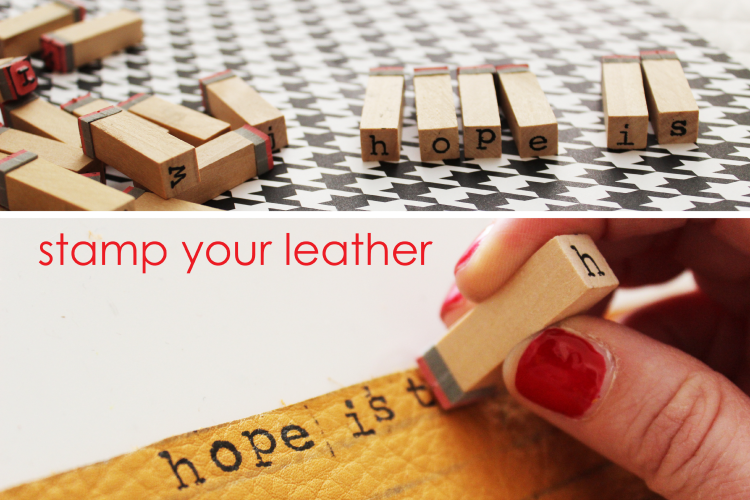 A DIY Leather Bracelet of Your Very Own! 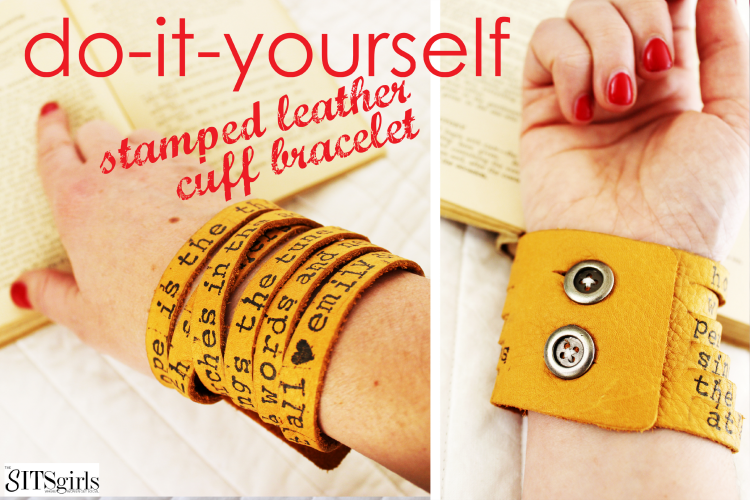 A DIY Leather Cuff is the perfect way to jazz up your wardrobe for spring! 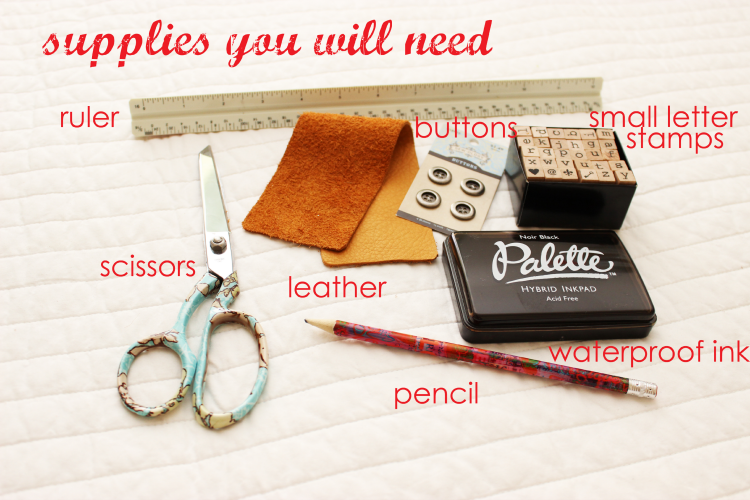 It requires minimal supplies and because leather doesn’t fray, the only sewing required is putting on the buttons. 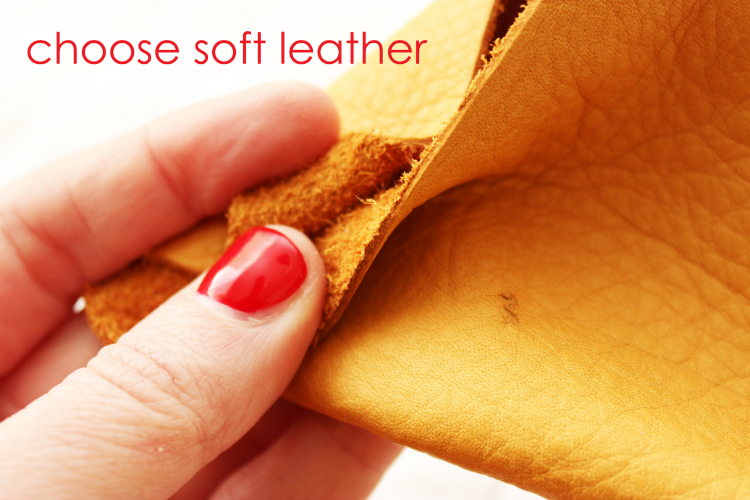 When choosing your leather, pick something very soft and pliable. Leather that is too stiff and rigid will not be able to wrap around your wrist and attach with buttons. 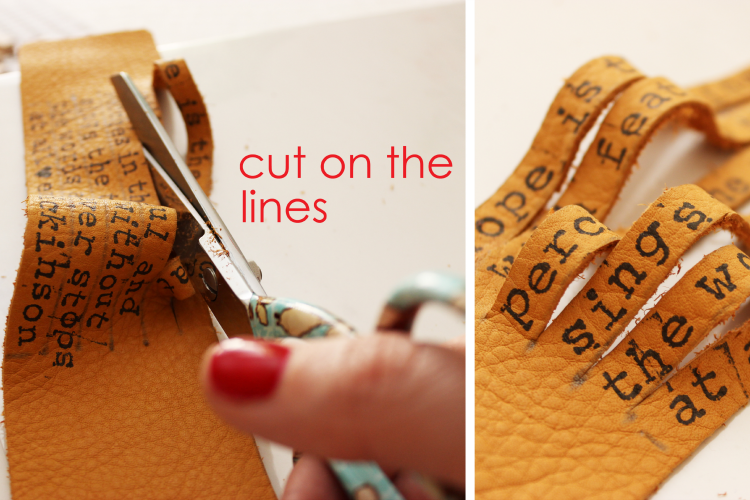 To begin, cut your leather to fit your wrist. I cut my leather to 9 inches long by 2 ½ inches wide. Then, using your ruler, measure in on each end of your bracelet by 2 inches and mark with your pencil. Next, measure the stamps you are using. 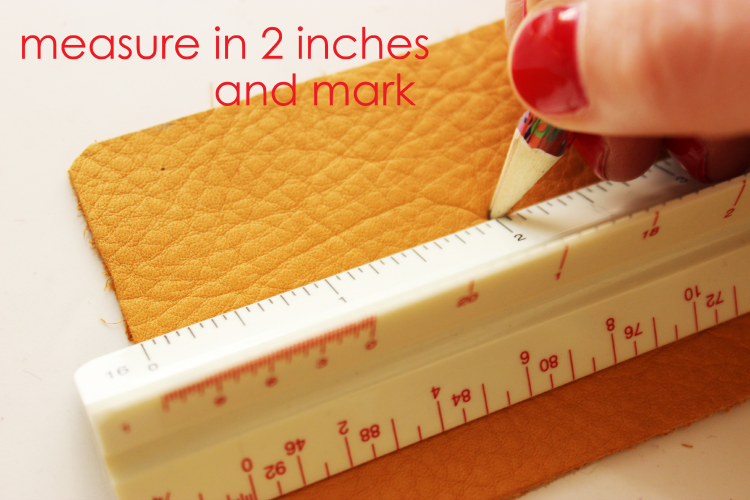 At the 2 inch point on each end, mark your leather with ample space for your stamps. My stamps required about 3/8 inch of space. 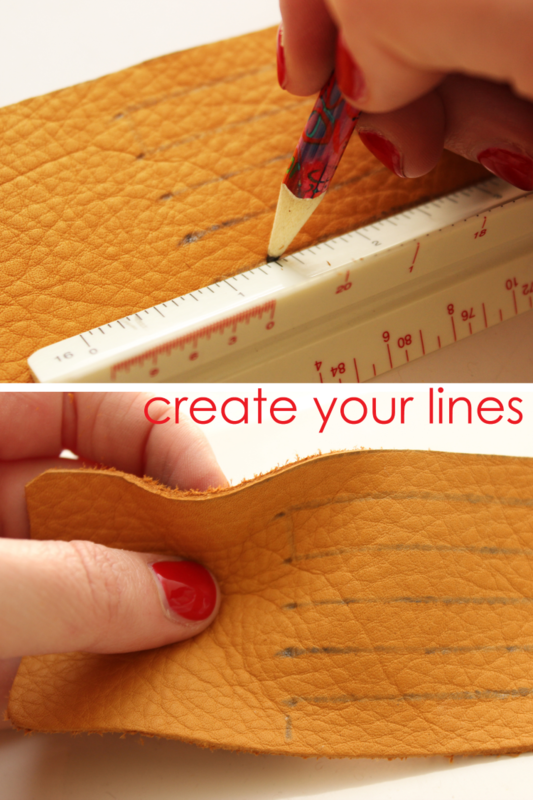 To create your cutting lines, connect your points on each end by using your ruler and pencil. Don’t cut your leather yet! 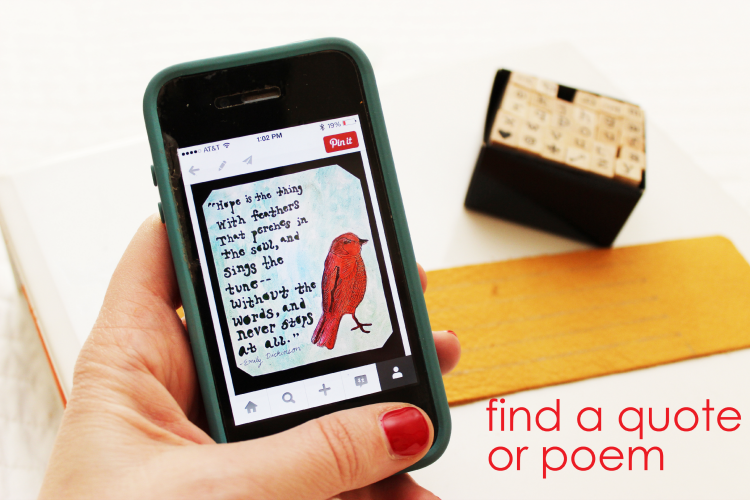 Next, find a quote or poem with just the right amount of words to fit on your bracelet. To test it out, you can stamp your quote on a piece of paper first. I found my quote on Pinterest. 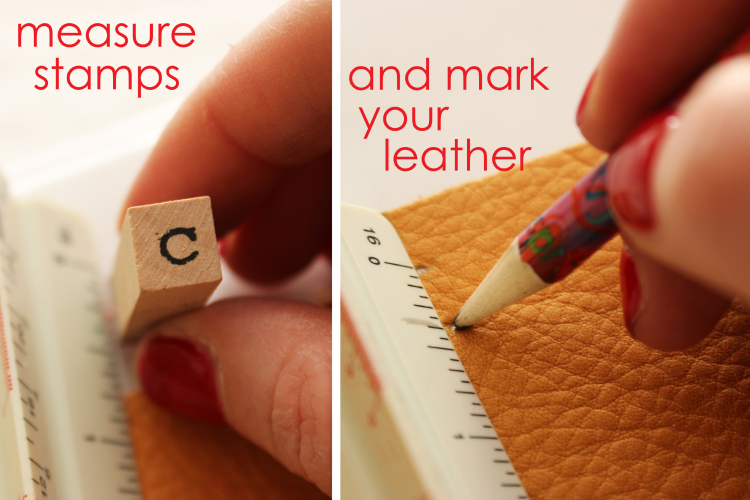 Using the lines you as a guide, stamp your leather using your waterproof ink. You cannot mess this up! If your stamping is not perfect, even better! This is a handmade item that is supposed to have flaws and imperfections. That’s what makes it more beautiful! Next, cut the lines on your leather to give the bracelet it’s fringy/bangle look. Take lots of care when you do this and make sure you cut perfectly straight! Erase any remaining pencil lines using a few swipes with a pencil eraser. To find out the perfect placement for your buttons, place the bracelet on your wrist and measure out where they should go. 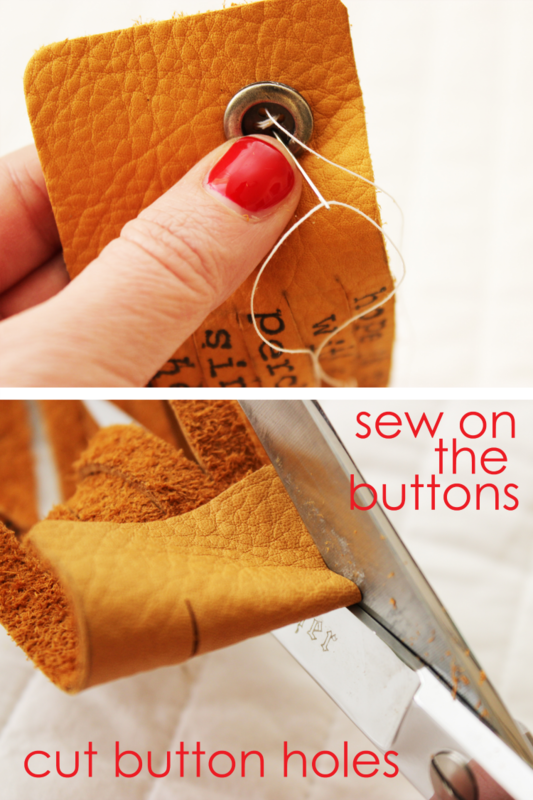 Attach the buttons using a needle and thread. Cut the button holes with your scissors. That’s it! The perfectly unique DIY Stamped Leather Cuff is that quick and easy to make! This makes a wonderful handmade gift or an easy accessory to add to your own wardrobe. My daughter made this bracelet last weekend, using a quote from Divergent. ALL of her friends love it! She now has orders to make this cute and trendy cuff – too many orders, she needs to be studying Bio-Chem!! Thanks for sharing your talent! Thank you for hosting a great party 🙂 Have a great rest of the week and stop by our party on Friday night. This is amazing!!! Great idea for my gift bags for my daughters 13th bday coming up! !Thank u! That is the coolest darn bracelet – well done!!! Super cute bracelet!! That is a very unique project! Holy cats! I’m running out to buy some leather – SO STINKING CUTE! LOVE the bracelet! Thank you for hosting! This is super cute! I love the use of stamps to put sayings on it. The bracelet is beautiful, thanks for the linky girls!! Thanks so much for the fabulous party, ladies! 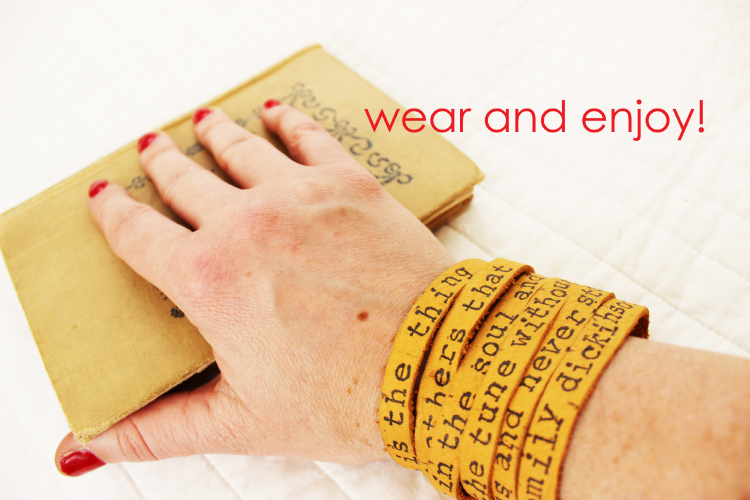 Love the stamped leather bracelet idea! That is FANTASTIC!!! So easy…so fun. 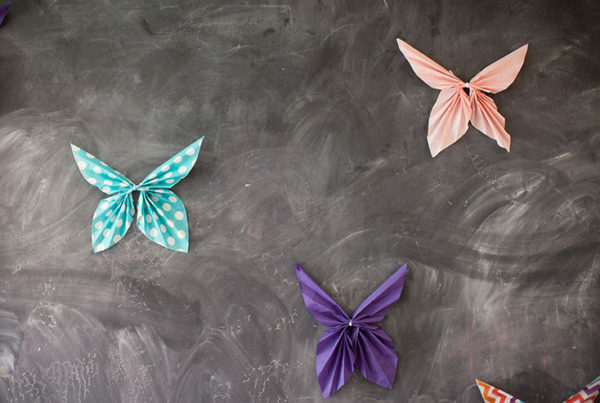 Great for a girl’s sleepover craft!! The stamping is unique! 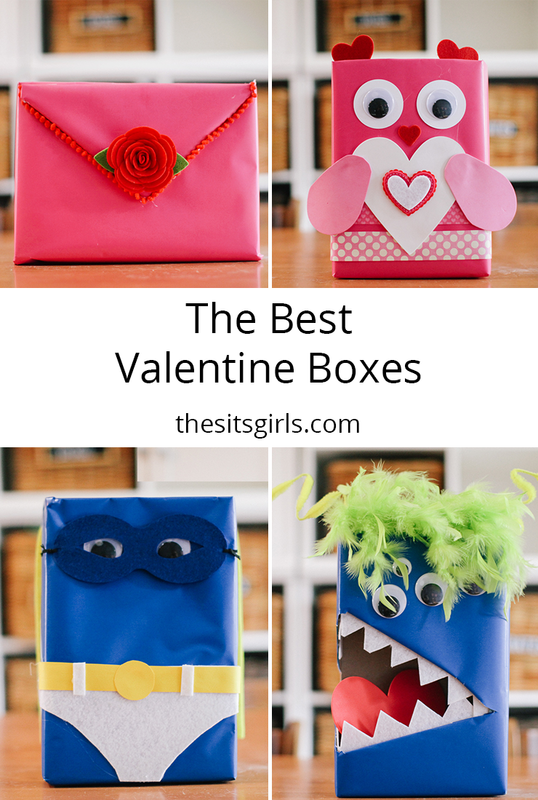 I use stick on Velcro squares and a a drop of super glue when I make similar things for my girls. Cool diy, thanks for sharing! Super cute project. Love the look of those letters!